Sharks are among the Earth's oldest creatures, dating back 300 million years to before the dinosaurs. They are also one of the world's most feared predators. The methods sharks use to find and hunt their prey vary as much as the number of shark species inhabiting our oceans. Before a shark can hunt, he needs to locate his prey. Sharks' highly developed senses allow them to detect even the most minuscule hints that prey might be near. 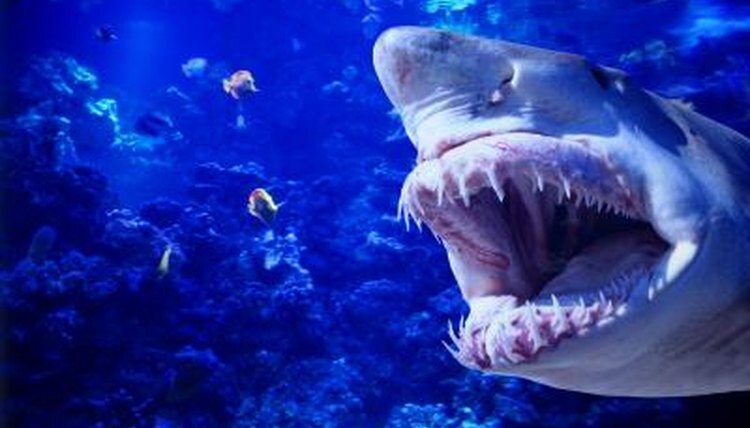 A shark's sense of smell is so acute that he can detect a single drop of blood in an Olympic-size swimming pool. He can tell which nostril picks up the odor first, allowing him to turn in the direction of his potential prey. "Lateral lines" that run down each side of the shark's body allow him to detect vibrations or pulses in the water, and small pores in the shark's snout, called ampullae of Lorenzini, let him detect electrical impulses emitted by other creatures. Once a shark has tracked down his prey, he stalks it before going in for the kill. Bottom-dwelling sharks are usually colored to blend in with the ocean floor. Active hunters sometimes circle a distance away from their prey to size up the situation before moving in for the kill. Most sharks hunt in the early morning or late evening, when less light penetrates the water, allowing them to blend into the shadows. Sharks have a variety of ways of catching prey. A great white will strike quickly, attempting to debilitate his prey with a single bite. He might even breach the water as he grabs his prey. The hammerhead has the smallest mouth of any shark species, and this shark is primarily a bottom feeder. He uses his wide head to pin stingrays to the ocean floor before feeding on them. All sharks have detachable jaws that can be thrust forward to catch the prey, although the amount of jaw mobility varies between species. Sharks are normally solitary hunters, but they sometimes form groups to hunt. One such example is the sevengill shark as he hunts the fur seal, which is usually too large for a single shark to overpower. Hammerhead sharks also sometimes hunt in groups. The hammerhead's wide head separates the eyes and nasal organs, giving him a much wider field of vision and a greater time delay between nostrils when smelling potential prey. These adaptations increase the hammerhead's ability to sense the location of the prey. Thresher sharks have been videotaped using powerful overhead and sideways tail slaps to stun and feed on schools of sardines. The world's largest shark, the whale shark, is also the most gentle. He feeds on plankton, collecting the tiny creatures by merely swimming with his mouth open. Slate: How Do Sharks Find Their Prey?